The Joseon Dynasty ruled over a united Korean Peninsula for more than 500 years, from the fall of the Goryeo Dynasty in 1392 through the Japanese Occupation of 1910. The cultural innovations and achievements of Korea's last dynasty continue to influence society in modern-day Korea. The 400-year-old Goryeo Dynasty was in decline by the late 14th century, weakened by internal power struggles and nominal occupation by the similarly moribund Mongol Empire. A wily army general, Yi Seong-gye, was sent to invade Manchuria in 1388. Instead, he turned back toward the capital, smashing the troops of rival General Choe Yeong, and deposing the Goryeo King U. General Yi didn't take power immediately; he ruled through Goryeo puppets from 1389 to 1392. Dissatisfied with this arrangement, Yi had King U and his 8-year-old son King Chang executed. In 1392, General Yi took the throne and the name King Taejo. For the first few years of Taejo's rule, dissatisfied nobles still loyal to the Goryeo kings regularly threatened to mutiny. To shore up his power, Taejo declared himself the founder of the "Kingdom of Great Joseon," and wiped out rebellious members of the old dynasty's clan. King Taejo also signaled a fresh start by moving the capital from Gaegyeong to a new city at Hanyang. 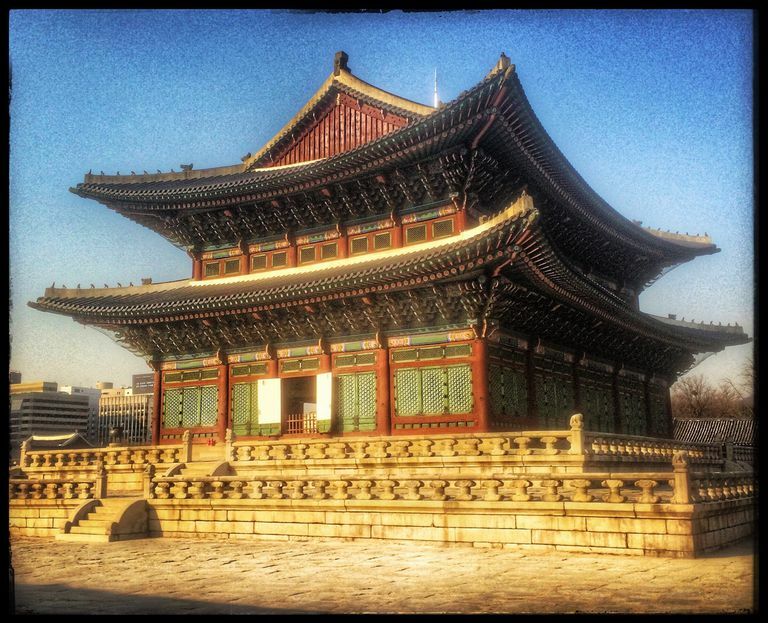 This city was called "Hanseong," but it later became known as Seoul. The Joseon king built architectural wonders in the new capital, including the Gyeongbuk Palace, completed in 1395, and the Changdeok Palace (1405). The young Joseon Dynasty endured political intrigues including the "Strife of the Princes," in which Taejo's sons fought for the throne. In 1401, Joseon Korea became a tributary of Ming China. Joseon culture and power reached a new pinnacle under Taejo's great-grandson, King Sejong the Great (r. 1418–1450). Sejong was so wise, even as a young boy, that his two older brothers stepped aside so he could be king. Sejong is best known for inventing the Korean script, hangul, which is phonetic and much easier to learn than Chinese characters. He also revolutionized agriculture and sponsored the invention of the rain gauge and sundial. In 1592 and 1597, the Japanese under Toyotomi Hideyoshi used their samurai army to attack Joseon Korea. The ultimate goal was to conquer Ming China. Japanese ships, armed with Portuguese cannons, captured Pyongyang and Hanseong (Seoul). The victorious Japanese cut off the ears and noses of more than 38,000 Korean victims. Korean slaves rose up against their masters to join the invaders, burning down Gyungbokgung. Joseon was saved by Admiral Yi Sun-sin, who ordered the construction of "turtle ships," the world's first ironclads. Admiral Yi's victory at the Battle of Hansan-do cut the Japanese supply line and forced Hideyoshi's retreat. Joseon Korea became increasingly isolationist after defeating Japan. The Ming Dynasty in China also was weakened by the effort of fighting off the Japanese, and soon fell to the Manchus, who established the Qing Dynasty. Korea had supported the Ming and chose not to pay tribute to the new Manchurian dynasty. In 1627, the Manchu leader Huang Taiji attacked Korea. Worried about revolt within China, though, the Qing withdrew after taking a Korean prince hostage. The Manchus attacked again in 1637 and laid waste to northern and central Korea. Joseon's rulers had to submit to a tributary relationship with Qing China. Throughout the 19th century, Japan and Qing China vied for power in East Asia. In 1882, Korean soldiers angry about late pay and dirty rice rose up, killed a Japanese military advisor, and burned down the Japanese legation. As a result of this Imo Rebellion, both Japan and China increased their presence in Korea. The 1894 Donghak peasant rebellion provided both China and Japan an excuse to send large numbers of troops to Korea. The First Sino-Japanese War (1894–1895) was fought mainly on Korean soil and ended in defeat for the Qing. Japan took control of Korea's land and natural resources through the end of World War II. China's hegemony over Korea ended with its defeat in the first Sino-Japanese War. The Joseon Kingdom was renamed "The Korean Empire," but in fact, it had fallen under Japanese control. When Korean Emperor Gojong sent an emissary to The Hauge in June 1907 to protest Japan's aggressive posture, the Japanese Resident-General in Korea forced the monarch to abdicate his throne. Japan installed its own officials in the executive and judicial branches of the Korean Imperial government, disbanded the Korean military, and gained control of the police and prisons. Soon, Korea would become Japanese in name as well as in fact. In 1910, the Joseon Dynasty fell, and Japan formally occupied the Korean Peninsula. According to the "Japan-Korea Annexation Treaty of 1910," the Emperor of Korea ceded all his authority to the Emperor of Japan. The last Joseon Emperor, Yung-hui, refused to sign the treaty, but the Japanese forced Prime Minister Lee Wan-Yong to sign in the Emperor's stead. The Japanese ruled Korea for the next 35 years until the Japanese surrendered to the Allied Forces at the end of World War II.